Individual trees and shrubs have value, but the variability of species, size, condition, and function makes determining their economic value difficult. The economic benefits of trees can be both direct and indirect. Direct economic benefits are usually associated with energy costs. Air-conditioning costs are lower in a tree-shaded home. Heating costs are reduced when a home has a windbreak. Trees increase in value from the time they are planted until they mature. Trees are a wise investment of funds because landscaped homes are more valuable than nonlandscaped homes. The savings in energy costs and the increase in property value directly benefit each home owner. The indirect economic benefits of trees are even greater. These benefits are available to the community or region. Lowered electricity bills are paid by customers when power companies are able to use less water in their cooling towers, build fewer new facilities to meet peak demands, use reduced amounts of fossil fuel in their furnaces, and use fewer measures to control air pollution. Communities also can save money if fewer facilities must be built to control storm water in the region. To the individual, these savings are small, but to the community, reductions in these expenses are often in the thousands of dollars. Trees provide numerous aesthetic and economic benefits but also incur some costs. You need to be aware that an investment is required for your trees to provide the benefits that you desire. The biggest cost of trees and shrubs occurs when they are purchased and planted. Initial care almost always includes some watering. Leaf, branch, and whole tree removal and disposal can be expensive. To function well in the landscape, trees require maintenance. Much can be done by the informed home owner. Corrective pruning and mulching gives trees a good start. Shade trees, however, quickly grow to a size that may require the services of a professional arborist. Arborists have the knowledge and equipment needed to prune, spray, fertilize, and otherwise maintain a large tree. Your garden center owner, university extension agent, community forester, or consulting arborist can answer questions about tree maintenance, suggest treatments, or recommend qualified arborists. Trees alter the environment in which we live by moderating climate, improving air quality, conserving water, and harboring wildlife. Climate control is obtained by moderating the effects of sun, wind, and rain. Radiant energy from the sun is absorbed or deflected by leaves on deciduous trees in the summer and is only filtered by branches of deciduous trees in winter. We are cooler when we stand in the shade of trees and are not exposed to direct sunlight. In winter, we value the sun’s radiant energy. Therefore, we should plant only small or deciduous trees on the south side of homes. Wind speed and direction can be affected by trees. The more compact the foliage on the tree or group of trees, the greater the influence of the windbreak. The downward fall of rain, sleet, and hail is initially absorbed or deflected by trees, which provides some protection for people, pets, and buildings. Trees intercept water, store some of it, and reduce storm runoff and the possibility of flooding. Dew and frost are less common under trees because less radiant energy is released from the soil in those areas at night. Temperature in the vicinity of trees is cooler than that away from trees. The larger the tree, the greater the cooling. By using trees in the cities, we are able to moderate the heat-island effect caused by pavement and buildings in commercial areas. Air quality can be improved through the use of trees, shrubs, and turf. Leaves filter the air we breathe by removing dust and other particulates. Rain then washes the pollutants to the ground. Leaves absorb carbon dioxide from the air to form carbohydrates that are used in the plant’s structure and function. In this process, leaves also absorb other air pollutants—such as ozone, carbon monoxide, and sulfur dioxide—and give off oxygen. By planting trees and shrubs, we return to a more natural, less artificial environment. Birds and other wildlife are attracted to the area. The natural cycles of plant growth, reproduction, and decomposition are again present, both above and below ground. Natural harmony is restored to the urban environment. Even though trees may be private property, their size often makes them part of the community as well. 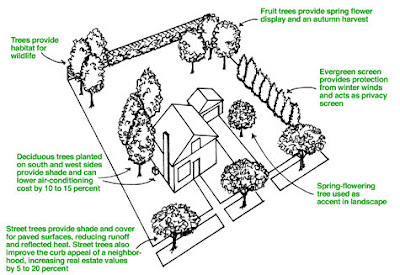 Because trees occupy considerable space, planning is required if both you and your neighbors are to benefit. With proper selection and maintenance, trees can enhance and function on one property without infringing on the rights and privileges of neighbors. City trees often serve several architectural and engineering functions. They provide privacy, emphasize views, or screen out objectionable views. They reduce glare and reflection. They direct pedestrian traffic. They provide background to and soften, complement, or enhance architecture. Most trees and shrubs in cities or communities are planted to provide beauty or shade. These are two excellent reasons for their use. Woody plants also serve many other purposes, and it often is helpful to consider these other functions when selecting a tree or shrub for the landscape. The benefits of trees can be grouped into social, communal, environmental, and economic categories. National tree of St Helena. Commidendrum robustum grows to a height of five to eight metres. It has a highly branching structure that forks low and produces an umbrella-like canopy. White flower heads droop from the ends of branches. Why is this species important? C. robustum is one of fourteen globally threatened and endemic tree species occurring on St Helena. This species was designated as St Helena's national tree in 1977. To help act as a symbol of the island's conservation and community spirit, a native forest of C. robustum was planted to mark the Millennium. The endemic plants of St Helena are of great biogeographical significance and provide the habitat for equally rare and unusual animal species. The gumwoods are known to be hosts for many endemic invertebrates, particularly weevils. C. robustum is found only on the sub-tropical island of St Helena in the South Atlantic, located 1,960 km from the south-west coast of Africa and 2,900 km east of South America. The area of St Helena is just 122 km². C. robustum woodland once stretched across one-third of the island at an altitude of 300-600m. The only woodland now remaining is at Peak Dale where about 1,000 trees grow on an area of 3 ha of steep slopes. There are smaller, scattered populations at Deep Valley (21 trees), Marias (<5>How do people use it? C. robustum has been an important source of timber since the island was settled by humans in 1659. The timber has been used for fuel and building. Although not used today, with its highly branched nature and dense hard, fine grain the wood has the potential to be of local value in the future if it can be managed sustainably, as a windbreak, as a source of pollen for honey production, and for high value products for the tourism industry. One local carpenter has already established a small experimental plantation to provide wood for craftwork in the future. 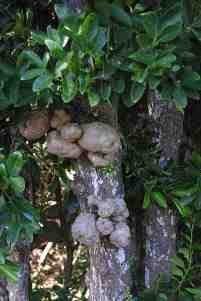 C. robustum is threatened primarily by the impacts of human activities. 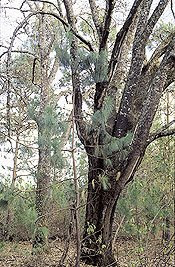 Since settling the island, humans have used C. robustum for timber and firewood. Forests have also been cleared for pasture. The introduction of goats and other browsing livestock to the island led to severe overgrazing and prevented regeneration. It is likely that timber shortages became apparent so quickly because the browsing of goats had been killing young trees for 150 years, so that the more accessible parts of the forests were in a senile state when later settlers arrived. In 1991 the Peak Dale C. robustum was attacked by the jacaranda bug Orthezia insignis, a sucking insect that takes the sap from trees. This threatened to devastate the remaining population until a biological control agent, a ladybird Hyperaspis pantherina, was introduced from Kenya. What conservation action is needed? A programme of conservation for C. robustum forests has operated since the mid 1980s, although lack of continuity and limited local resources have limited progress. Efforts at Peak Dale have included fencing off the site to prevent damage from browsing sheep and cattle, controlling the growth of exotic weeds and planting young trees, often with the help of school groups and volunteers. A programme of replanting has been in operation at Horse Plain Point. The Millennium Gumwood Forest Project has resulted in the planting of over 4,000 trees in a previously barren and degraded wasteland. The area was originally part of the 600 ha Great Wood that was lost through deforestation in the 18th and 19th centuries. C. robustum has also been established behind High Peak, at Pounceys, along the golf course and in the grounds of many of the island's first and middle schools.Attention is also being focused on small and disjunct wild populations that have either been attacked by the jacaranda bug or heavily invaded by alien plant species such as flax Phormium tenax , black olive Olea africana and ink, Cestrum laevigatum. Weeds have been cleared at a number of sites and gumwoods replanted to restock affected populations. Seeds have been collected from different populations and seedlings are being grown in nurseries ready for planting back into different sites. The species is endemic to the Cape Verde Islands: Sto. Antão, S. Vicente, S. Nicolau, Boavista, Santiago, Fogo and Brava. In 1935, Chevalier collected and observed it on various locations where it no longer exists. Today the species is only found growing on steep cliffs and it is unknown which plant communities S. marginata may have been associated with. How do people use it? The tree has hardy wood and makes good quality firewood. In the Red Data Book of Cape Verde (Leyens & Lobin (eds.) 1996) S. marginata is classified as "Endangered", many populations consisting of only a few individuals. It is at severe risk of extinction on the islands of S. Vicente, S. Nicolau, Santiago and Brava and is classified as Critically Endangered. Where humans have access to the tree populations, the number of individuals continues to decline. Due to human pressure on the islands of S. Vicente, S. Nicolau, Santiago and Brava, these populations are described as ‘relictual’. The main populations of the species are in one or more protected areas on the island and national law protects the species from picking and uprooting. Efforts have been made on the island to make people aware of the plant and the need for its conservation. 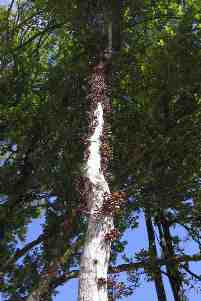 A deciduous small tree that grows up to 15 m in height and occurs in sub-montane to montane dry forest in Mexico. It has a dark bark and is characterized by bright red foliage in early spring. This species represents one of the Quercus species considered of great importance in Mexico. Habitat of Q. hintonii has been seriously destroyed and reduced, undermining the viability of the species. Q. hintonii wood has a variety of local uses, being part of the traditional culture of Tejupilco people. Q. hintonii is endemic to Mexico, occurring in the south-east of Mexico State between 1300 and 2000 m. A recent study by the Sir Harold Hillier Gardens and Arboretum together with the University of Puebla has determined that this species covers just 46 000 hectares, distributed across three highly disturbed populations. Q. hintonii wood is used locally for tool handles, beams and fencing poles, but primarily for firewood. The wood is traditionally used to bake "las finas" bread, the characteristic taste of which is imparted by the smoke. The populations of Q. hintonii have been dramatically reduced as a result of habitat loss to the point where the species is considered in danger of extinction. Agriculture (maize and fruit trees), coffee plantation and road construction have all contributed to the decline in populations. The species has also been highly affected by grazing, which prevents regeneration. The recent study as part of the Global Trees Campaign revealed that the current status of Q. hintonii population is strongly associated with the development and economic activities of the local communities. Conservation measures include the involvement of local authorities and landowners, training on plant propagation, field research, and the development of an education campaign.Collaborative research between Mexican experts from the University of Puebla and staff from the Sir Harold Hillier Gardens & Arboretum in the UK has led to the development of a conservation strategy for Quercus hintonii, which was presented to the Regional Education Co-ordinator, the presidents of municipalities and the authorities in charge of reforestation. In addition, an educational guide to the conservation of the species has been produced and an agreement has been reached to provide local training in oak propagation techniques. The only confirmed native location is in Basque France, in the Vallée des Aldudes. In 2000, a group of 20 to 30 Prunus lusitanica ssp. lusitanica was found at 850m in the vallée d'Ossau, near Bitet, in the Parc national des Pyrénées. This population has not been confirmed to be native, however, it is situated far from any garden or park and appears ‘ancient’ as the group includes an old, dry stump. The species has an extremely limited range. Areas of the Vallée des Aldudes burned in 1990, however the majority of the individuals seem to have sprouted from the base. 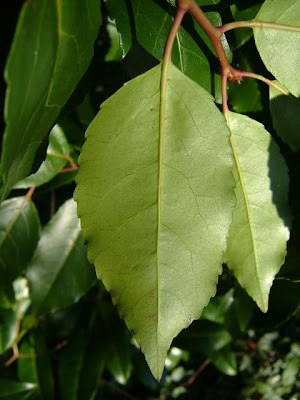 Prunus lusitanica is fully protected in France (on the National List) by Ministerial decree of 20 January 1982, in which destruction, collection and sale are prohibited. The first locality has not benefited from any particular management. The new locality in the national park will be monitored and management needs prescribed by the park's scientific service. One of 10 endemic Tambourissa species in the country. This species is a striking tree, with cauliflorus flowers coming straight out of the trunk. The male flowers look like small red starfish covered in white paint marks. The female flowers look like a small wooden bell that takes the form of a small pot when it turns into a fruit. The fruit gives the tree its common name of ‘monkey’s chamber pot’ (pot sam zacot). When ripe the walls of the chamber pot open disgorging black seeds covered in bright orange flesh. This species has no commercial value or local use. This species is endemic to Mauritius and is found in lowland coastal forest. Why is it threatened? There probably about 100 individuals of this species. Lowland coastal forest is one of the most threatened forest types in Mauritius. Most individuals of this species are found in a privately owned forest where there are few laws to protect the plants. What conservation action is being carried out? Pokemeboy is confined to an area of 38 km², of which only 25 km² is suitable (terrestrial) habitat. The actual area of occupancy has been estimated as less than 10 km² of limestone. 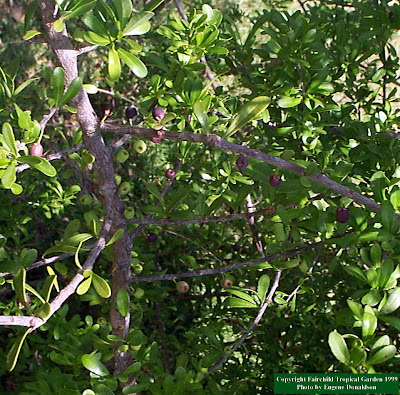 This legume is important for promoting succession of vegetation, as well as providing a suitable habitat and food source for the Anegada iguana, Cyclura pinguis, a species itself numbering less than 200 individuals. Pokemeboy is endemic to Anegada Island in the British Virgin Islands (part of the Caribbean island bio-geographic region). 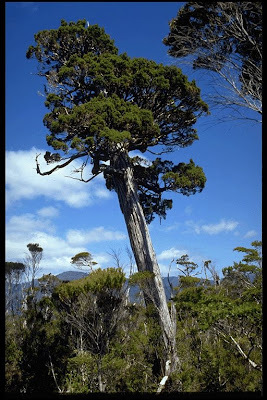 A dense, thorny evergreen acacia, it is planted for shade, but the roots also physically break the crusts of limestone rock on which it lives, allowing other species to grow and subsequentally increasing fertility. The island is under extreme pressure for residential and tourism development. This has already resulted in documented habitat fragmentation and loss, leading to a decline in the quality of available habitat. It has been suggested that this will accelerate in the next few years, resulting in a continued decline in the quality of the habitat and a reduction in the number of mature individuals. Construction of marinas along the coastal areas has been an on-going issue in the BVI, as well as other tourism-related development. As part of a year 2000 Darwin Initiative Project on Anegada, a collaborative effort between the BVI National Parks Trust, Fauna and Flora International and the Royal Botanic Gardens Kew, Dr. Mike Gillman of the UK’s Open University is investigating the threats to and rates of regeneration of this species. Gillman has found relatively widespread adult trees, but little regeneration, giving concerns for the long-term survival of the species. Work is continuing and an ex situ population has been established at the JR O’Neal Botanic Garden on Tortola to investigate germination and seedling establishment. Cipres is an endemic evergreen conifer that forms pure and mixed forests. 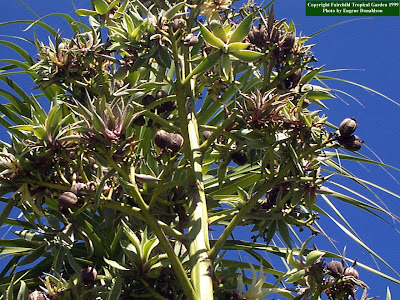 It is characterized by its narrowly pyramidal shape, growing to between 1.5 and 15 m in height, and by its scale-like imbricate leaves in four rows. It is a slow-growth species that may live 400-500 years. Cipres forests form unique ecosystems in the Valdivian, Patagonian and Magellanic rainforests of southern Chile. The timber has been heavily exploited for decades and has great traditional use. In the XI Region of Chile the species has an extensive cultural and historical value, with generations of people linked to the exploitation and trade of the tree. P. uvifera occurs in Chile from 39° 30’ to 54° S in the Coastal and Andes Range of Chile. In Argentina it is possible to find this species on the eastern side of the Andes between 41° and 47° S. This species grows in extremely humid sites located in flat places, known as Magellanic moorland. Owing to timber cutting, cipres forest have been dramatically degraded and destroyed, particularly in the XI Region. Large-scale destruction of the forest during colonial times and the widespread opening up of the lowland area have led to the extinction of the species from most of its original distribution. Illegal harvesting is still occurring in many forests containing cipres. Extensive fire setting and grazing have prevented regeneration, contributing to the species’ decline. This species was placed on Appendix I of the Convention on International Trade in Endangered Species (CITES), which has reduced international trade. The first initiative developed by Universidad Austral de Chile and Corporacion Nacional Forestal was the implementation of a demonstrative pilot of sustainable management and restoration of cipres forest. This activity involved the training of small-scale owners.Taking this initiative as a basis for future development activities, it is very important to promote sustainable management in unprotected areas. This promotion must reach the local forest owners that have used this species for decades. Other important measures include the development of alternative uses for cipres, such as non-timber forest products and eco-tourism. The restoration of degraded cipres forests is other important component that has to be considered in future conservation actions. The Global Trees Campaign is developing an initiative with Universidad Austral de Chile and local organizations to restore, conserve, and manage the remnant forests in the XI Region of Chile. 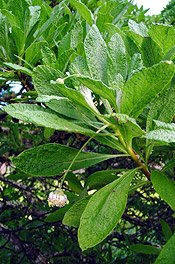 These activities will be essential to provide sustainable tools for the benefit of Pilgerodendron uvifera in Chile.